Tempeh is a whole-bean, fermented soybean cake, originally developed in Indonesia, and like its cousin tofu, it will readily absorb flavors. However, the texture is more varied and interesting than that of untreated tofu. Here is a great explanation of tempeh and tofu, if you’d like to know more. And here is another radish*rose recipe featuring tempeh: Buffalo Ranch Salad with Tempeh and Garlic Croutons. Equipment: Electric steamer or steamer insert that fits inside a pot with a lid. Large skillet or wok. Steam the tempeh: If using an electric steamer, fill the water tank, place the tempeh in a single layer in the steamer basket, cover, and set for 10-12 minutes (I like it a bit softer so I do 12 minutes). If using a pot with insert, fill the pot with water up until the bottom of the insert (without letting water in the insert), place the tempeh in the insert, bring to a boil, lower the heat, and steam for 10-12 minutes. 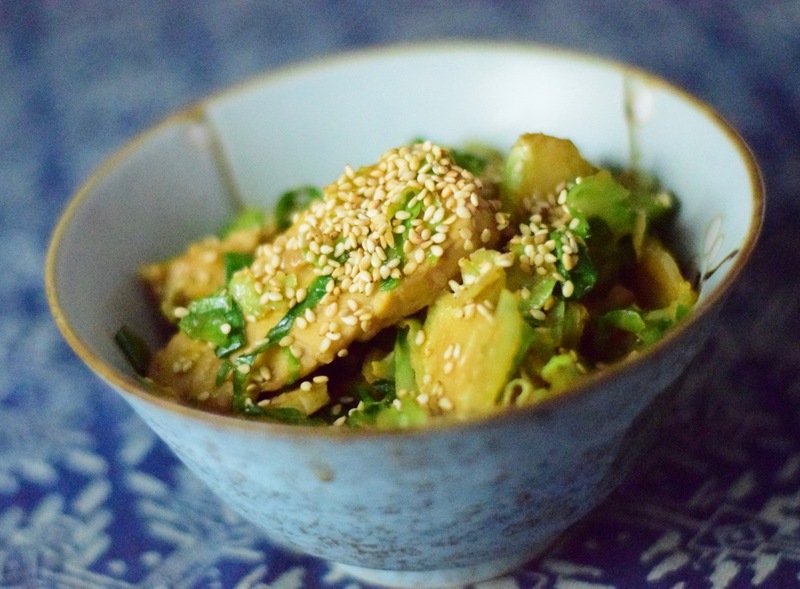 Prepare sprouts/cabbage: Combine the butter, tamari, brown sugar, water, and sesame oil in a large skillet or wok over medium-high heat. When the butter has melted, crank the heat up to high, stir in the shredded brussels sprouts or cabbage so it's all coated with tamari-buttery goodness, let sit for about 1 minute untouched (this helps get a nice char on some of the sprouts), then sauté until just starting to collapse - this only takes a few minutes. Assemble the dish: Once your tempeh is steamed and your brussels sprouts/cabbage are done, combine together, stirring well. Serve by itself or over rice, topped with sliced green onions and toasted sesame seeds. Enjoy!